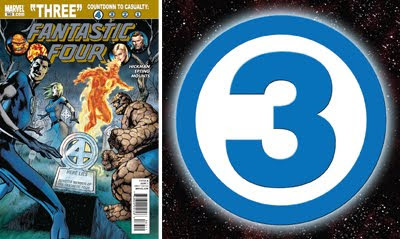 Well after months of hype, tomorrow Fantastic Four #583 is finally unleashed upon the earth, with the countdown clock tick-tocking on down towards the death of one of the four. If you have never read the FF in your life or just not in a wee while, you owe it to yourself to take a trip on this little number. Not only is artist Steve Epting jumping onboard for the ride, Jonathan Hickman has being doing the work of the insanely brilliant (or brilliantly insane) in this book and it's all built to this new era launching storyline; 'Three'. CBR released an exclusive preview from the upcoming instalments on the weekend, featuring Reed and the Silver Surfer talking business with Galactus! And you know if old purple boots is stepping into the ring, it is going to be huge! 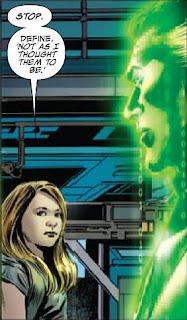 Still back to tomorrow, here's the full teaser for #583 - just remember to ask your LCS for your copy! Go the Four!